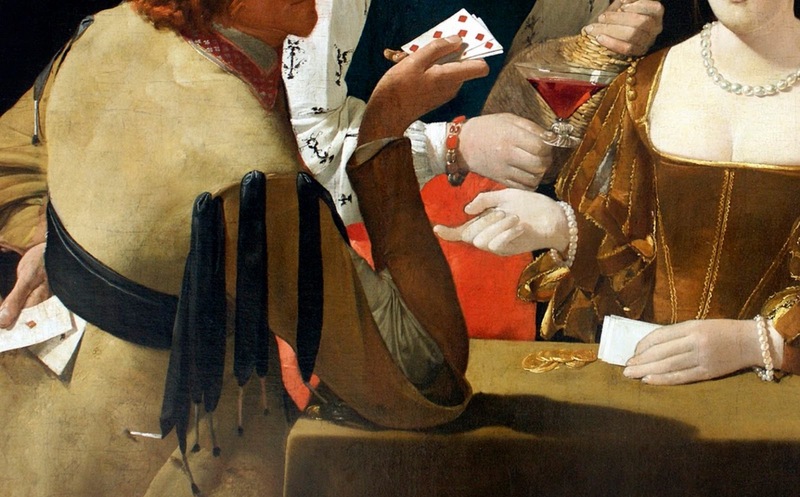 The only diurnal painting by Georges de La Tour in the Louvre along with the Saint Thomas, the Cheat illustrates a theme that was frequently taken up in the wake of Caravaggio**. 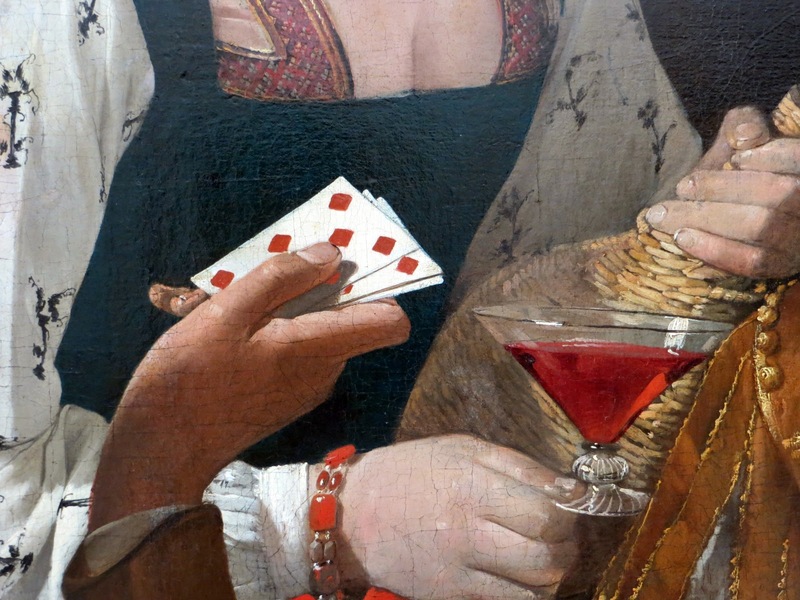 The young man is subjected here to three major temptations according to 17th-century moral standards: gambling, wine and lust. 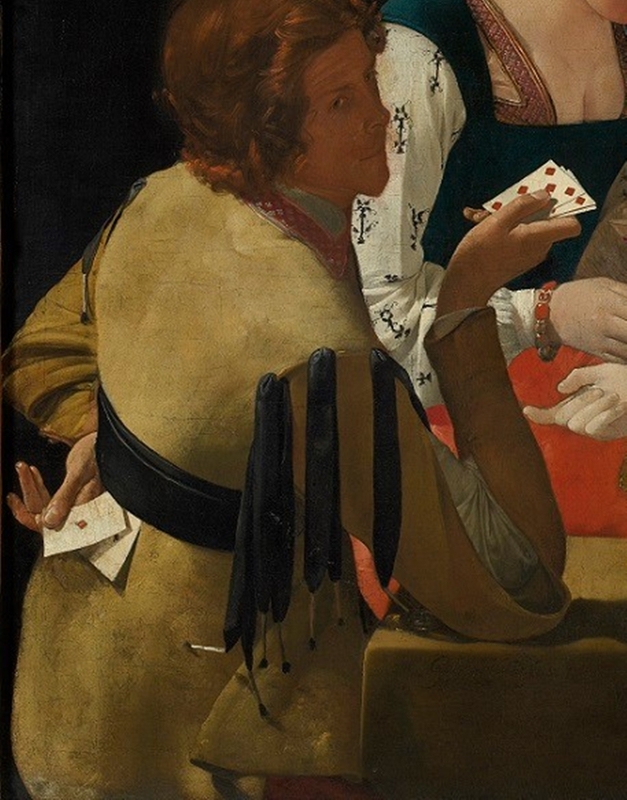 Another version with notable variations is known to exist, the Cheat with the Ace of Clubs (Fort Worth, Kimbell Art Museum). 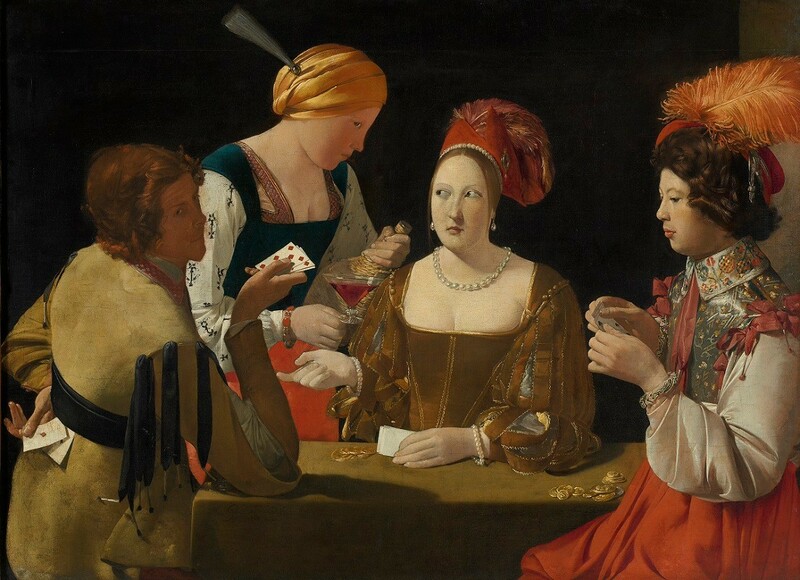 One of George de La Tour’s masterpieces and a classic of French painting**, the Cheat occupies a particular place among the artist’s works for several reasons. Purchased in 1926 by Paul Landry from an antique dealer on the Île Saint-Louis, the painting bearing the artist’s handsome signature, was made public by Hermann Voss, in 1931, in an article that was to deliver the artist from the depths of oblivion. In this respect, the Louvre painting is one of La Tour’s “firsts”. 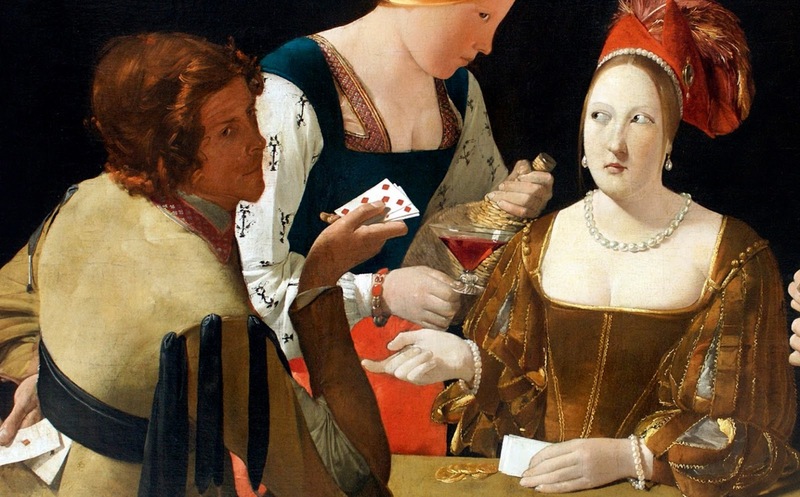 In 1934, the Cheat featured in the memorable exhibition of the Painters of Reality (Peintres de la réalité) that brought French 17th-century painting back to glory and marked the revival of Georges de La Tour. 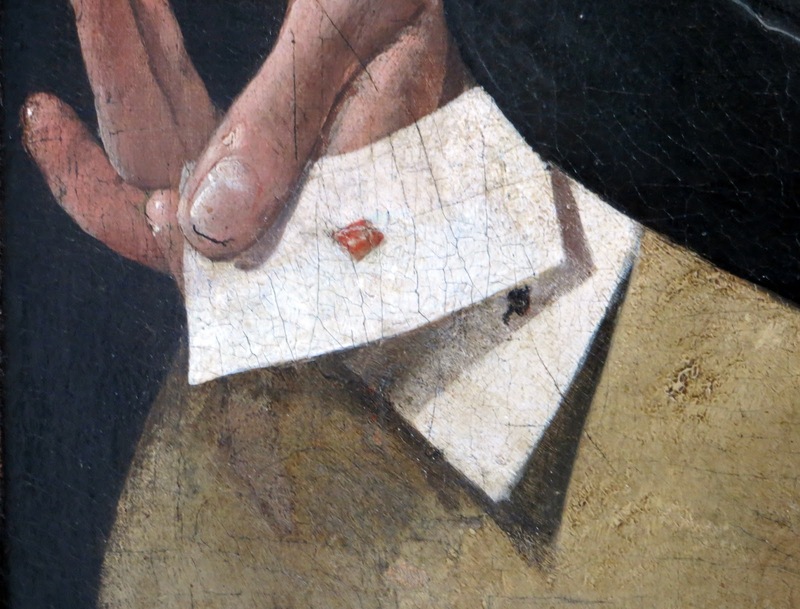 This sparked a growing craze for the artist and the corpus of his works broadened. Lastly, the year 1972 saw the first monographic exhibition devoted to the painter. It was a huge success and, on this occasion, Landry donated the work to the Musée du Louvre. Four figures are gathered around a table and are playing cards. They all seem to be suspended in time. 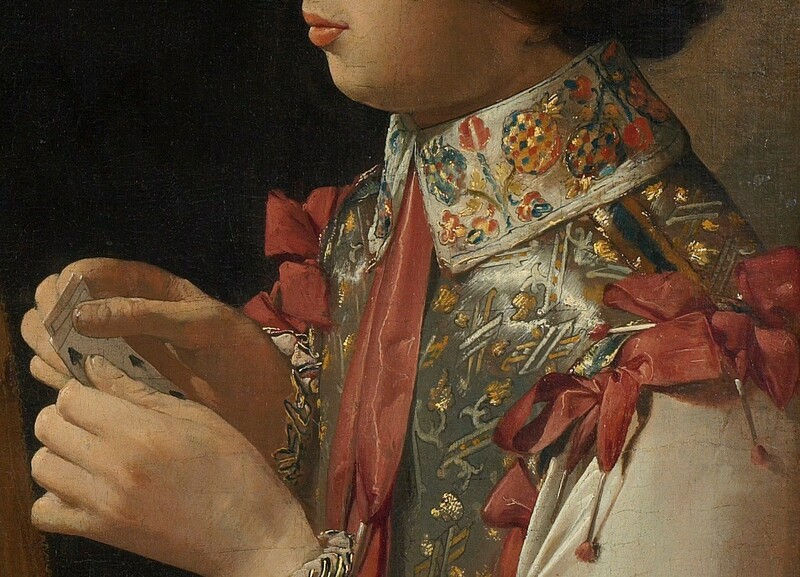 On the right, a lavishly dressed man is going through his cards. He is set apart from the other figures and does not share in their complicity, which is visible in their sidelong glances. 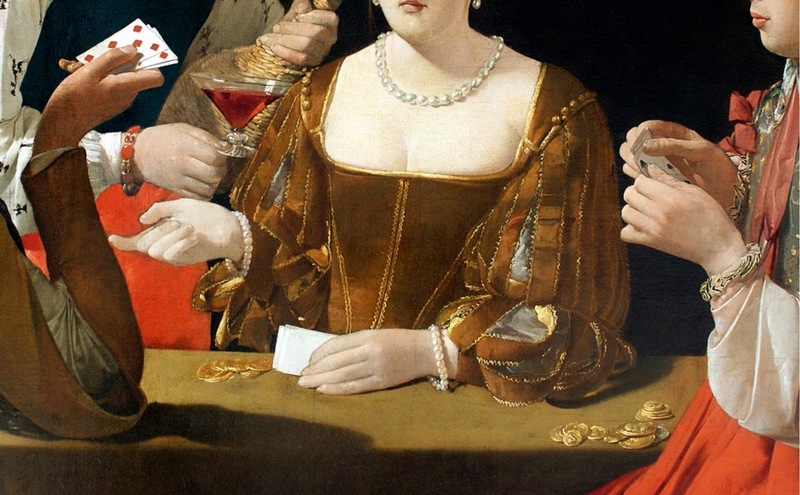 Slightly off-center, a woman with a sophisticated hairstyle and plunging neckline beckons us with her eyes and hand position toward the left side of the composition where another player, plunged in shadow, is discreetly producing an ace of diamonds from under his belt. To complete the scene, a maidservant is preparing a glass of wine between him and the courtesan. The situation seems quite clear. 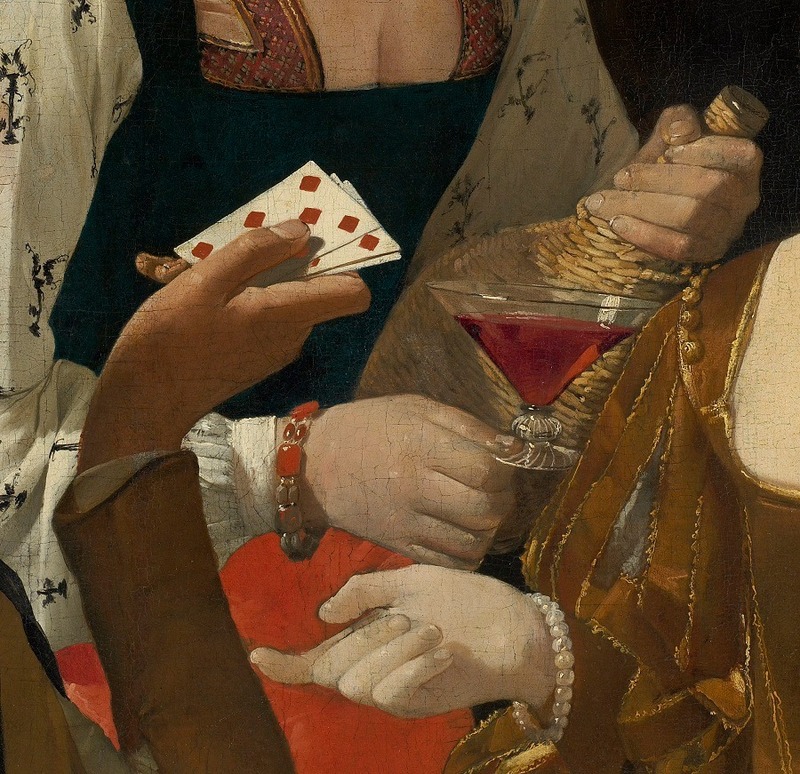 The young man, drawn into the game by the courtesan not lacking in assets, is intoxicated and will be divested of his possessions by the man on the left. 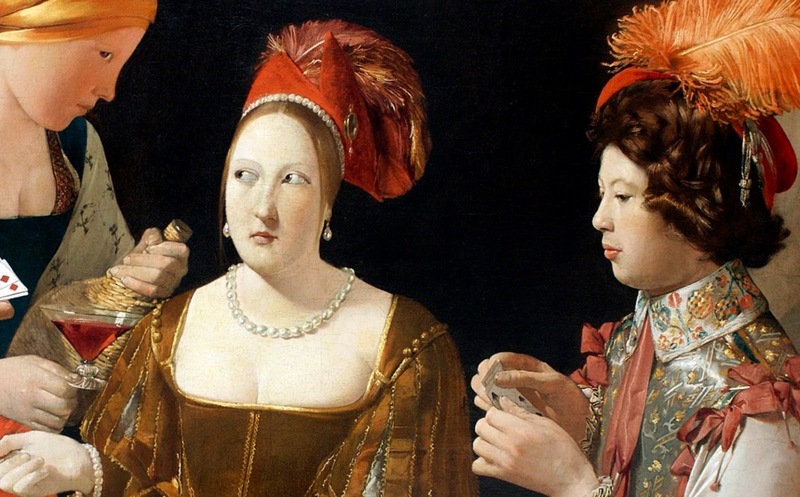 The painting reworks a subject introduced by Caravaggio in a work currently in the Kimbell Art Museum in Forth Worth, the companion piece to the Fortune Teller in the Louvre by the same artist. A canvas similar in subject painted by La Tour (Metropolitan Museum, New York) formed the pendant to the composition in the Louvre, or more probably to an earlier version of it, also in Forth Worth. In the simplified volumes, the oddness of the composition, and the comical aspect of the subject matter, the Louvre’s Cheat found pride of place in 20th-century sensibility. 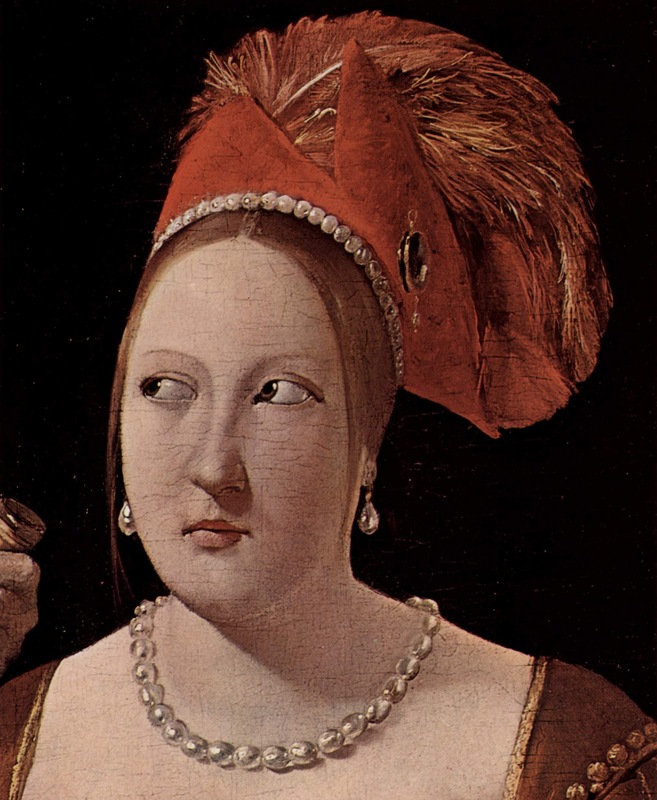 Da questo celebre dipinto, Il baro con l'asso di quadri, scoperto nel 1926, è cominciata la ricostruzione dell'opera 'diurna' del pittore Francese** Georges de La Tour (Vic-sur-Seille, 10 marzo 1593 - Lunéville, 30 gennaio 1652). Firmato in basso a sinistra, sul bordo della tavola, è stato variamente datato. La Tour riprende il tema del baro proposto da Caravaggio e molto spesso trattato dopo di lui, sovrapponendovi il tema del figliol prodigo spogliato dalle donne, anch'esso consueto al tempo. Nella tela si trovano così riunite le tre massime tentazioni per la morale del Seicento: la donna, il gioco, il vino, offerti alla meditazione dello spettatore, rapito e indotto alla contemplazione dall'immobilità sospesa che governa la scena, dove si mescolano uno strano senso di gravità e ironia. L'oscurità totale del fondo fa risaltare gli stupendi brani di pittura pura: la natura morta composta dal fiasco e dal bicchieere di vino, i dettagli dell'abito della cortigiana al centro, la casacca ricamata del giovane all'estrema destra. De La Tour dipinse anche un'altra versione del Baro, dove la carta truccata è un asso di fiori anziché di quadri come qui.